Worked on an educational sign to be installed in four locations in Mill Valley. This project has been funded by the Marin Wildlife and Fisheries Committee. Conducted Cleanup Days at Boyle Park and Park Terrace Park in conjunction with Bloomathon. Collaborated with the Bay Model Association on a Mill Valley watershed mapping project. Funding came from the Marin County Clean Water Stewardship Project. Donated three framed copies of the Mill Valley Watersheds Map to the City of Mill Valley, for display at the Library, City Hall and the Community Center. Created a Mill Valley StreamKeepers display board which was shown at the Bay Model and Mill Valley Public Library. Organized education walks in the watershed with city officials and the public. Communicated and met with city planners and responded to land use plans with concerns for the health of the watershed. Attended Planning Commission and City Council meetings and advocated for measures to ensure protection of riparian corridors and habitats. Participated in Marin County and other Bay Area watershed programs. Obtained non-profit status from the State of California. Completely overhauled our web site. 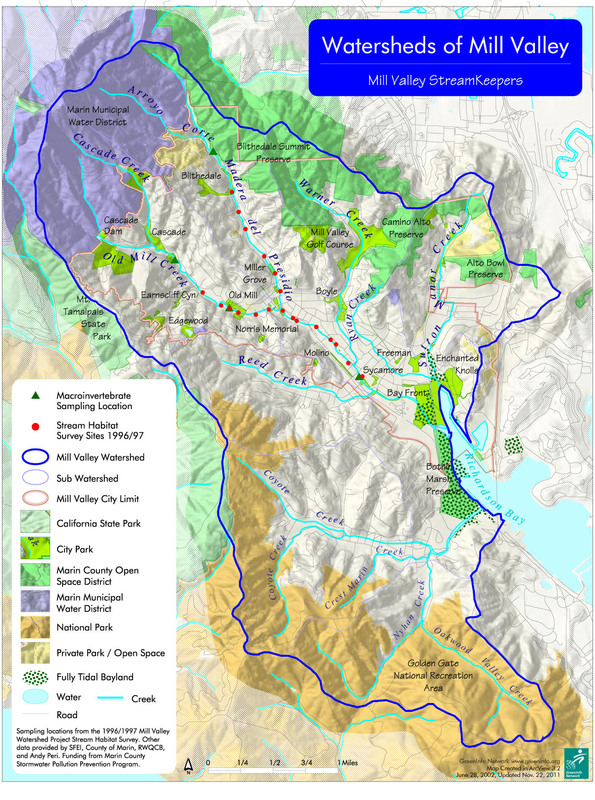 The Mill Valley Watershed Map was created by Mill Valley StreamKeepers and Bay Model Association. It shows the watersheds of Mill Valley and Tam Valley. Depicted are sub-watershed boundaries, streams and their tributaries, as well as some of the data collection points from the past and the present.The map presents a picture from a watershed perspective as a means of geographic reference, which can help viewers understand their sense of place in the watershed from a geographic perspective.